Survivor: Philippines (2012) - 9th place, 10th out - 3rd juror. 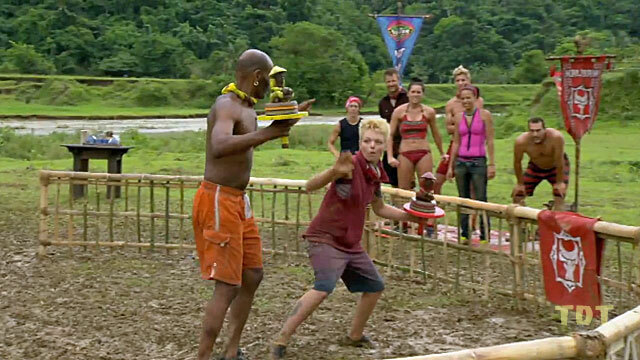 Voted out in Episode 9, "Little Miss Perfect" (Day 25). Philippines Ep. 1 RC/IC: "Share the Wealth" - Does running stage, Tandang blows lead on puzzle (2nd*/3). Philippines Ep. 2 RC/IC: "Manila Folders" - Hauler, Tandang wins! (1st/3). Philippines Ep. 3 RC/IC: "Deep In Thought" - Plays, Tandang doesn't lose (2nd*/3). Philippines Ep. 4 RC/IC: "Swing Break" - Plays, and Tandang streaks to another win (1st/3). Philippines Ep. 5 RC: "Idol Hands" - Now down to two tribes, easily beats Dana in his bout; Tandang wins. Philippines Ep. 5 IC: "Thrash, Splash & Bash" - Competes, Tandang wins. Philippines Ep. 6 RC: "Bog Roll" - Tandang negotiates surrender to Kalabaw. Philippines Ep. 6 IC: "Philiping Out" - Catches, Tandang wins. Philippines Ep. 8 RC: "Catch of the Day" - Does well, but team (Carter, Skupin, Pete, Abi-Maria) loses. Philippines Ep. 9 RC: "Muddy Waters" - Artis and his team (Skupin, Pete, Lisa) loses. *Note: Second-place finishes in the three-tribe phase of Philippines count as half a win. Philippines Ep. 7 IC, "Wrist Assured" - Third-to-last man standing (3rd/7). Philippines Ep. 8 IC, "Snake in the Grass" - One of seven people eliminated in first stage (6th/10). Philippines Ep. 9 IC: "Paddle Out" - Places no balls as Skupin breezes to an easy win (bottom 6/9). Philippines, Ep. 7: RC Saint-Amour (voted out, 4-2-0). Philippines, Ep. 8: Jeff Kent (voted out, 5-4). Philippines, Ep. 9: Five votes, from Skupin, Penner, Carter, Malcolm, Denise (voted out, 5-4). Philippines, Ep. 14: Voted for Denise Stapley (who won, 6-1-1). Gordon Holmes at XfinityTV.com (9/13/12): "Survivor: Philippines Pre-Game Interview: Artis Silvester"
Rob Cesternino at RHAP (11/15/12): "Artis Silvester on why he has no love for Skupin"
Gordon Holmes at XfinityTV.com (11/15/12): "Survivor Castaway Artis Silvester: 'I Did Not Like Abi'"
Steve Helling at People.com (11/17/12): "Artis Silvester: I'm Not An Angry Man"
Daniel Fienberg at HitFix.com (11/17/12): "Artis Silvester talks Survivor: Philippines"
"Personal Claim to Fame: Beating stage 4 cancer. Inspiration in Life: My ex-wife - she’s my light, my strength, my everything. I pray everyday that we are brought back together. Hobbies: Martial arts, motorcycle riding and bowling. Pet Peeves: Traffic, know-it-all people, bullies or people that prey or pick on those weaker than themselves. 3 Words to Describe You: Spontaneous (sometimes explosive), opinionated and competitive. 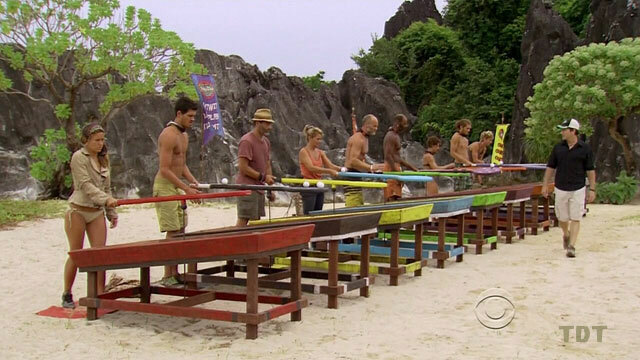 Survivor Contestant You Are Most Like: I’m a combination of Rudy, Rupert and James. I have Rudy and Rupert’s cunning leadership and likability. I have James’s physical appeal – even at 52. Reason for Being on Survivor: The million dollar prize and the chance for the experience of a lifetime. Plus, I’m tired of yelling and screaming at my TV about how the contestants are playing. Why You Think You’ll 'Survive' Survivor: I have physical and mental strength, creativity, adaptability and a sense of humor. I’m an incredible manipulator and I have an uncanny ability to remain calm in stressful situations. Why You Think You Will Be the Sole Survivor: When the odds are stacked against me that is when I shine the most. Although I’m definitely no angel, I believe I do have a guardian angel watching over me. No one has been more persistent than me to be on the show and it is because I know I can win if given the chance." "'I'm like a chameleon with the ferocity of a praying mantis,' says Artis. I have no idea what that means…but I love it! 'The minute that I feel that you're threatening me, I will chew you up and spit you out.' A man who has already beaten stage 4 cancer should be able to handle the rigors of living off the land, but unless Artis is able to adapt socially to his younger tribemates, he may be the one that is spit out."